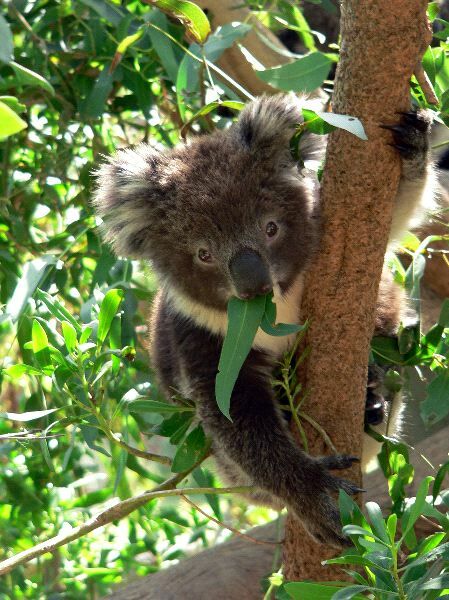 The Koala belongs to the group of animals known as marsupials but it is very often mistaken for being an actual type of bear. They range in size from 27 to 26 inches tall and may weigh 20 pounds. The Koala has very soft fur that is thick. It may range in coloring including brown, black, gray, and white. They have a very large head and round ears. They spend most of their time in the trees and eating bamboo. They spend almost all of their time eating and sleeping. They are in danger of extinction due to habitat destruction and very low reproduction rates.